swap-bot | Random moosages as I see fit. Yes, I participated in another swap. It’s been a long time. This particular swap was interesting too. It was a flat mail swap over six weeks, i.e. one piece of flat mail each week for six weeks. But…I ended up making something that was not flat for the last week. 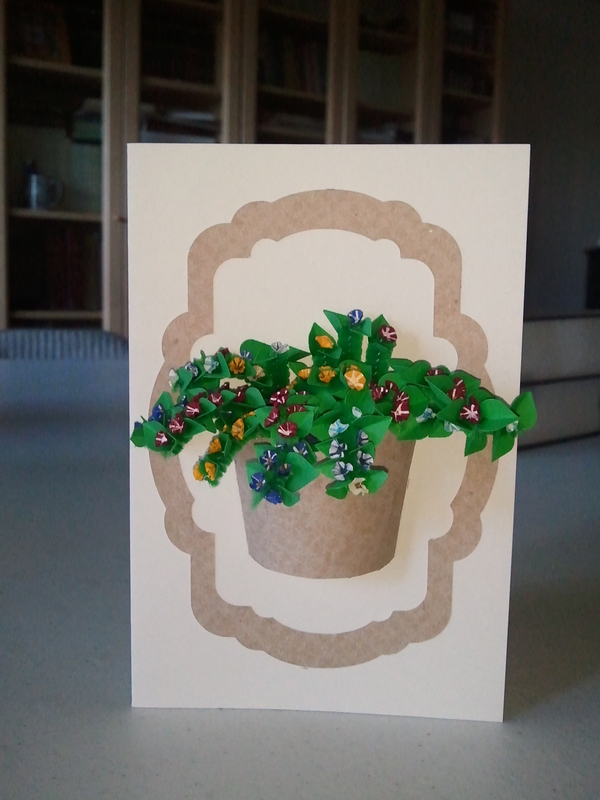 Enter the mini petunia card! Why petunias? My swap partner is a fan of them. I have rather fond memories of petunias as well. I remember my mother used to have petunias in her garden when I was little. I realized early on that petunias give a satisfying pop feeling when you pull the petals off from the rest of the plant. My mother did not grow petunias after that. Anyway, petunias blossoms are interesting in that they have five or so petals that are fused together (which is why they’re so satisfying to pop off the rest of the plant), so you can’t construct them like other flowers. It’s hard to get that fused look if you paste a bunch of different petals together. But! I found this site, which specializes in making dollhouse furnishings and they had a tutorial on how to make a tiny pot of petunias. It was perfect for what I was thinking of, size and everything. You can find the directions on the site I linked. They have pretty good instructions and photos documenting the whole process. I did change a few things. I used various weights of paper. I didn’t do a paint dot in the middle. I just used more white pen. Or whatever colored pen I was using. I made some various blues and golds as well. My heart punch actually has a couple (which means “two” and is not synonymous with “a few”) different sizes on it, which meant I could have different sized leaves. I also used green pipe cleaners instead of floral wire because I had it on hand. And since I didn’t use a quick drying glue, but instead my normal stupid tacky glue (that takes forever to dry and that I’m trying to get rid of but for some reason it’s a bottomless bottle), the fuzz on the pipe cleaners helped keep flowers and leaves in place while the glue dried. The fuzz also meant that I didn’t have to use any “soil” in my flower pot, which kept the card front nice and light and capable of standing up on its own. Also, I like the fuzziness of pipe cleaners. 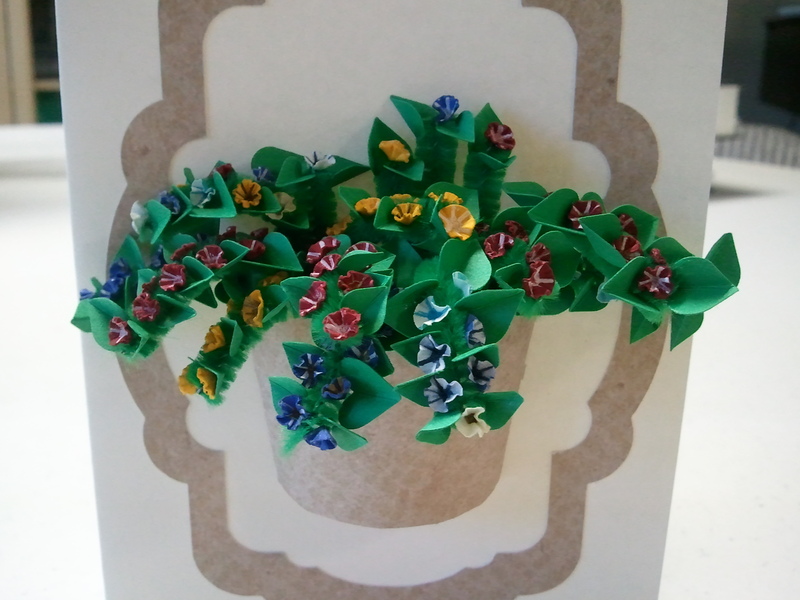 Assembled flowers. I do realize that petunias don’t grow on vines, but it’s easier to assemble when you pretend they do. 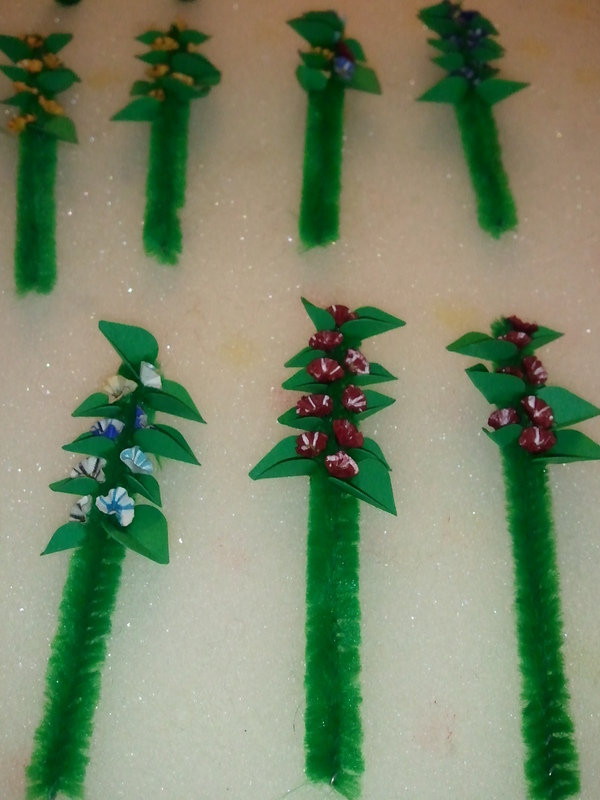 I didn’t get a shot of the flowers drying in the foam. I actually lost a few (more than two) of them in the foam when I accidentally pressed too hard with my stylus (it came with my Silhouette) and the foam swallowed up the flower. The foam I used is actually marketed for making your own seat cushions. 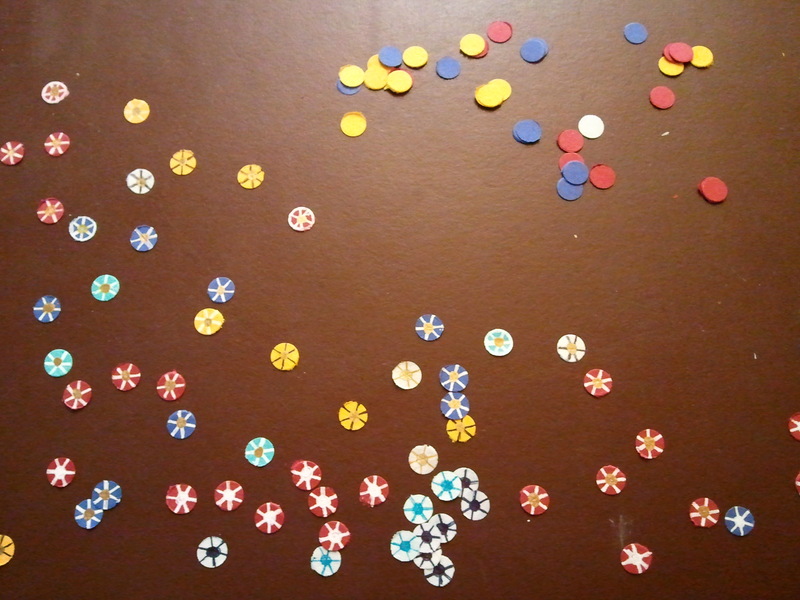 It’s pretty cheap to get and I cut it up for various purposes, such as drying petunias or needle felting. 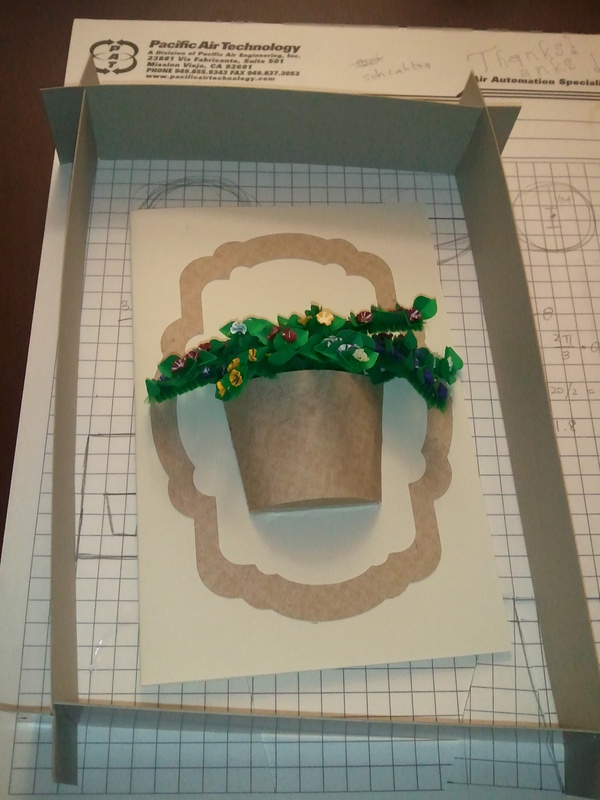 The pot for the flowers was made out of paper and some calculating (arc lengths, segments of radii) in order to get the correct size for an enclosed bottom and some tabs for gluing everything down. I think I even saved the template I made for future use. I was going to make a more traditional looking terracotta flower pot originally, but I decided it took up too much space. 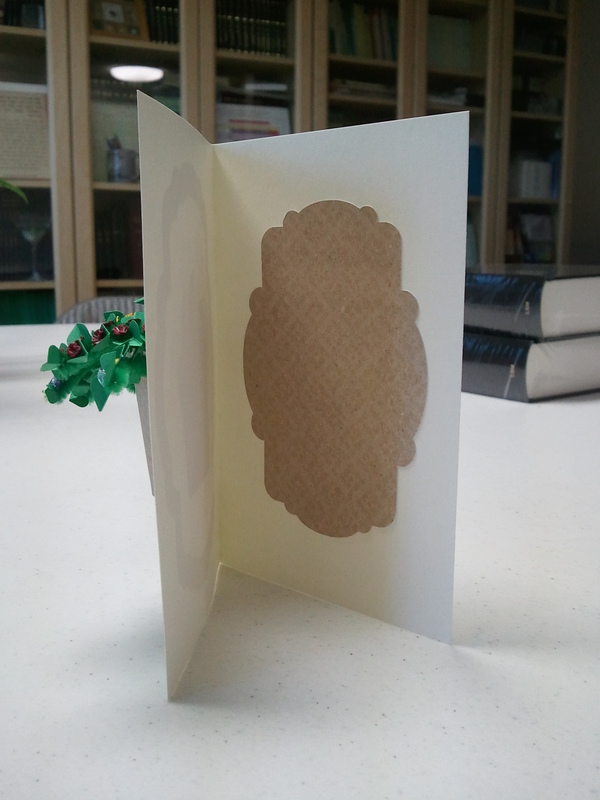 The card is only 4″x6″, after all. Now remember how I said this was for a swap? You know how swaps are mailed? I didn’t have a small box so I devised this to get it through the mail. I stuffed that into a manilla envelope sandwiched between two thin pieces of cardboard. Arrived at the destination just fine. 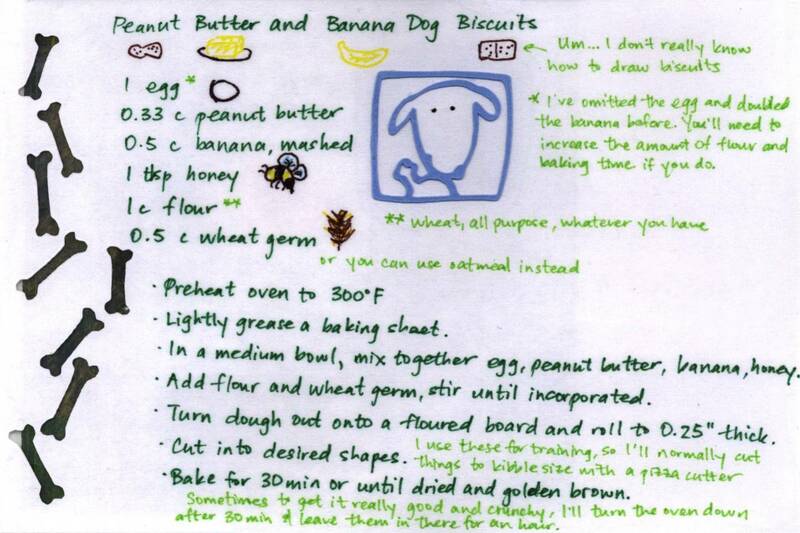 I recently participated in a swap in which you traded recipes for dog treats with three other people. But, the recipe had to be presented on a decorated card. Here’s what I sent out. I punched little bones into the side of the card (you can see the postcards I had the in background peeking through) and then doodled over the rest of the card. The dog saying hi is from Cricut (Paper Pups). To continue with the theme, I wrote little notes on dog shaped cards that I cut from miscellaneous pieces of scrapbooking paper. This…ended up being a bit of a problem. I had to use my larger scraps and one of them was from this project. You see, with the sickly green background and skulls and crossbones, you might think that I was sending a recipe for poison. That’s…totally not true. 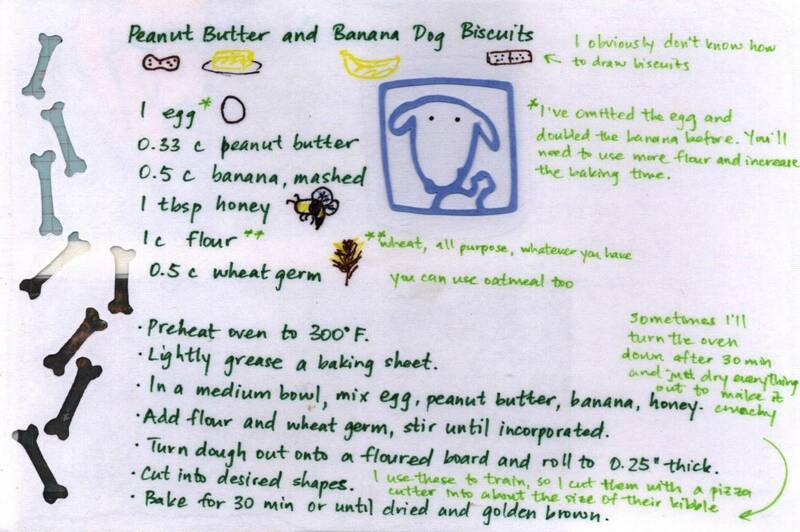 My dogs are very fond of these biscuits. They always know when I’m going to make them and you can’t push them out of the kitchen. Yaris will even go and wait next to the oven while they’re baking. You can make them for people too. Just add more honey. Anyway, I carried my dog theme out all the way to the envelope with dog stickers and Up themed stamps with Dug and Mr. Frederickson featured front and center. I’ll update the post with the recipe later as I’m currently gallivanting about in Indiana and I don’t have access to the file. Or you can try making out those decorated cards. 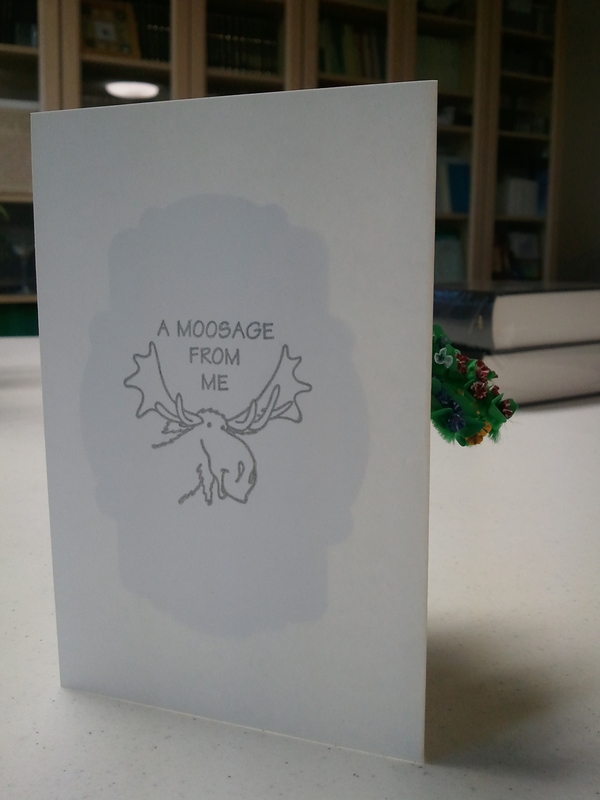 I actually sent along non-decorated cards to my swap partners too since the decorated cards were so…decorated.